Having just returned from sunny Spain where my summer flip flops were put to good use, I thought I'd keep the holiday feeling going by joining in with a swap hosted by Shendy over on the DoCrafts forum. The swap involves creating an ATC in the shape of a flip flop and decorate it in anyway you like. So I made some pretty ones, some sparkly ones and some yellow ones (the yellow ones are going in a lottery on New Inspirations Yahoo group). My favourite ones though are the green dirty ones!!! They have been made from foam and dirtied up with some distress ink. The toe impressions were made by pressing the rounded end of my pokey tool into the foam. They are my favourites because I have a pair just like them for real - they are my trusty garden flip flops and they live by my back door ready to serve me whenever I need to pop outside. I hope whoever gets them in the swap doesn't find them too objectionable - lol!! More birthday gifts - how lucky was I! I received two more beautiful gifts one from Maureen which arrived just before I went away and the other from Cindy which was waiting for me when I returned. 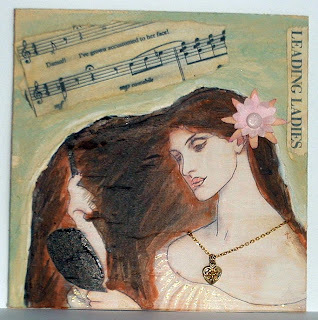 Maureen's gift is a 'Wild Women' pin brooch which is simply delightful and I believe made from wool topps hand embellished onto felt and decorated with stitching, beads and charms. It has so much detail and even the fingernails have been painted - I love it! Maureen is so talented as making things like this, I wouldn't have a clue where to start first. Cindy's gift is a concertina friendship book which has crackle glazed covers, loads of beautiful collaged vintage images and rubber stamping. The photo above only shows part of the book as it is double sided - the colours are absolutely glorious too and this is now amongst my treasured things. It's my birthday on Wednesday (oh no, not another one so soon!!) and I'm going on holiday Wednesday morning so I decided to open the birthday ATCs (BRAKs) that I have already received today. I guessed that I would be busy packing and clearing up tomorrow so it made sense to open them early - is that a good enough excuse? LOL!! I was very touched by some beautiful gifts and BRAKs I received and would like to mention a few here. Trudy sent me an early present a few weeks ago - a beauiful Jigsaw Book which has a phenomenal amount of detail including a miniature sewing kit and a gorgeous button fairy on the back. She doesn't have a blog, but has some pictures of it on her Flickr photostream . It is well worth a look, she is a very talented lady. Talking of talented ladies, there are two more I'd like to mention. Jan who sent me a beautiful pin brooch with an altered scrabble tile (and an ATC with one of her famous image transfers on! ), and last but not least, Margaret who sent me the most delightful, colourful wall hanging which I'm calling 'Pink Poodle' even though it probably isn't a poodle at all - but just look at it's face and feet! 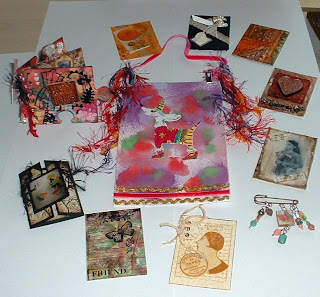 I received some beautiful ATCs too (some of which are pictured). Thank you everyone who took the time to send me things - I feel very humble, but happy!!!!! I'd also like to take this opportunity to say a big THANK YOU to everyone who has in the past commented on my blog - I'm not sure of the correct blog etiquette to say thank you, but just like you to know they are all appreciated. OK, end of speech, you can wake up now! See you all in a couple of weeks. 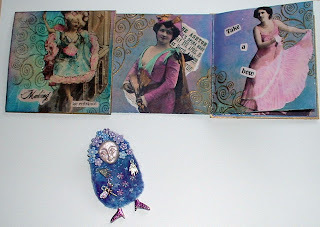 I've made another journal page for Astrid's Round Robin challenge in advance for the same reason as 'My Fair Lady' below. This page is for Heidi. The background is a mixture of acrylic paints, metallic rub ons and some gloss finish. There is quite a bit of shine to it so unfortunately it hasn't photographed very well. 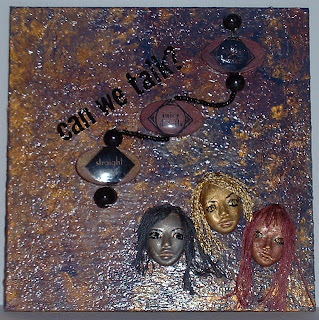 The Style Stones have rub on words on them - all linking to the 'Can We Talk' rub on in the background. I coloured them with metallic rub ons and finished with some of Anita's 3-D Clear Gloss Finish. They were all linked together with some black beads. As Heidi had mentioned that she didn't want a particular theme and that 'anything goes' I shall send the page off to her before waiting to see her own page. I've jumped the gun a bit and made a journal page for Cindy before actually seeing her own page for real. I've seen a photo of her page on the Astrid's Round Robin blog and as I'm going on holiday next week I'm worried that on my return I'll have a pile of journal pages waiting for me, and as I've had an idea of what to do for Cindy's page for a while, I thought that I'd get on and do it! I won't post it off to Cindy yet though - just in case she has specified a colour theme which doesn't fit my page. Cindy's theme is 'Woman' and my page isn't deep and meaningful at all! It just has a picture of a pretty woman on it which is actually an altered magazine image (Bernie Berlin style). She is embellished with a paper flower in her hair and a real chain and locket around her neck (which isn't real gold unfortunately!!) The background and woman's hair is painted with acrylic paints. The music score is an extract from the musical 'My Fair Lady' and I have decorated the back of the page with further extracts of music score from the musical too. Although the page is quite simple, I am really pleased with how it's turned out, so if when I receive Cindy's page I discover that mine doesn't fit the brief, I'll be quite happy to keep it anyway.